*All photos by Samba to the Sea unless noted otherwise in caption. Tamarindo, Costa Rica, has earned a reputation for being one of the country’s top surf and party destinations, but there’s much more to this popular Costa Rican beach town. The laidback lifestyle, tropical beaches, and legendary sunsets keep visitors coming back year after year, and its central location makes it a great home base for exploring Northern Costa Rica. 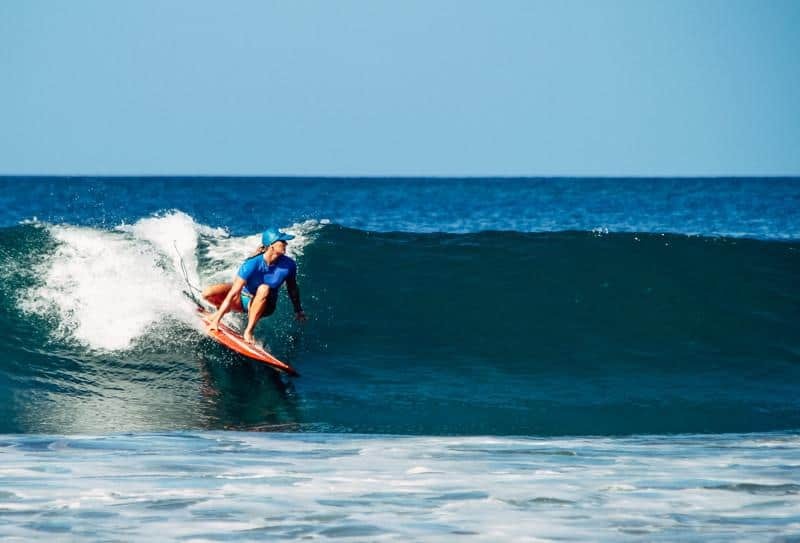 There’s a whole lot going on in this buzzy surf mecca, so we hit up local surfer chica Kristen for her favorite places to eat, drink, surf, shop, and play in Tamarindo, Costa Rica. Five years ago Kristen fell in love with the Pura Vida lifestyle and traded her corporate job in NYC for a surfboard and camera in Tamarindo. Kristen and Gidget livin’ the life. When she’s not working on her photography business and print shop at Samba to the Sea, you can find her surfing Costa Rican waves, photographing breathtaking sunsets, or playing on the beach with her Chihuahua, Gidget. Pura Vida, indeed. Take it away, Kristen! Located on the Northern Pacific Coast in the province of Guanacaste, Tamarindo, Costa Rica, has become one of the most developed and accessible beach towns in the country. 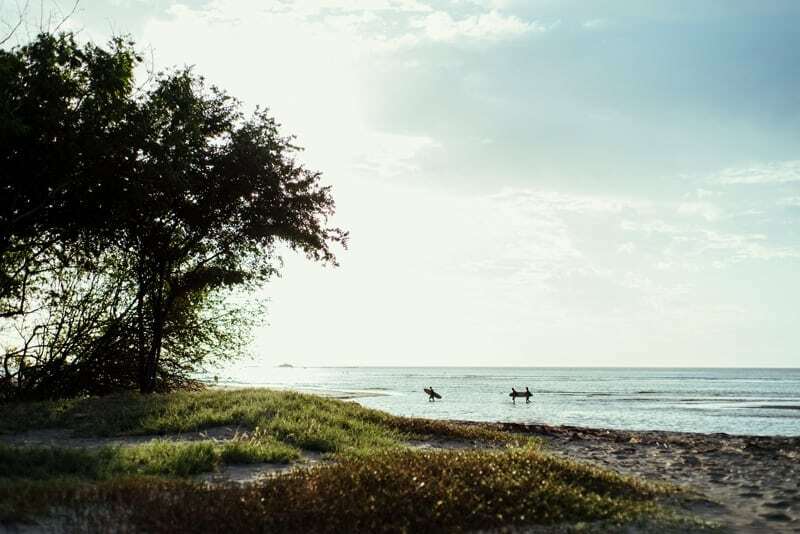 Once a tiny fishing village, Tamarindo is now a well-known destination thanks to the surf movie Endless Summer II that put this surf town on the map. Despite the steady stream of development and visitors, Tamarindo has maintained a laidback vibe and is a great surf destination for solo travelers and families alike. Tamarindo is about an hour drive from the closest airport, Liberia International Airport, and a 4 – 6 hour drive (depending on traffic) from Costa Rica’s capital San Jose, and its airport Juan Santamaría International Airport. THE RIVERMOUTH (ESTERO) is my playground. Tamarindo tends to be more of a longboard wave and most people usually head out of town to surf other beaches, but surfing the Rivermouth in the mornings is like hanging out at your local coffee shop; you paddle out, say your hellos, have a quick chat or laugh, then mid-sentence paddle to catch a wave. Depending on the positioning of the sandbars, there can be some phenomenal lefts and/or rights. Best time to surf is mid-high tide, but can be super fun at low tide. It is one of those waves that you just need to keep on checking all day, as the wave changes with the tide. BEACH BREAK is located right in front of the parking lots, a lot of beginners take lessons here, but with the right swell, there are some amazing lefts that can take you all the way to the Rivermouth. Best time to surf is mid-high tide. PICO PEQUEÑO is a reform wave coming off of the rocks of Pico Grande. Pico Pequeño an unreal spot for aspiring young kids wanting to be shredders. Usually when nothing else is breaking in town, there at least will be a small wave at Pico Pequeño. Surf at high tide. PICO GRANDE • During a good swell, this wave can be amazing, with rights and lefts breaking off of the rock. Pico Grande is a fast, more advanced surfer wave. Surf at high tide. CAPITÁN SUIZO is located all the way down the beach, towards Playa Langosta. Surf schools bring their students here, but during a good swell, Suizo is a really nice wave. Also, since Suizo faces a different direction than the other spots in town, if the wind is coming from the south, it will be offshore vs side-shore elsewhere in town. Best time to surf is incoming high tide. Wave Levels: The surf here is very diverse. Just about every two miles there is another beach – and another surf spot. The surf pretty much goes all the way down to Panama. There are waves for all levels, from beginner to advanced, and there are beach breaks, point breaks, reefs, and river mouths. You can surf various spots all in one day. The Tides: Tide changes about 7-10 feet, so surfing a certain spot depends on the time of day. You could show up to a spot at low tide and find no waves, and then a couple of hours later there’ll be waves breaking up and down the beach. The Winds: During the summertime (mid-November to April) here in Guanacaste (Northwest Costa Rica), the wind usually blows offshore all day. Once the rainy season comes, the wind turns onshore usually in the late morning and then can shift back to offshore after an afternoon storm. 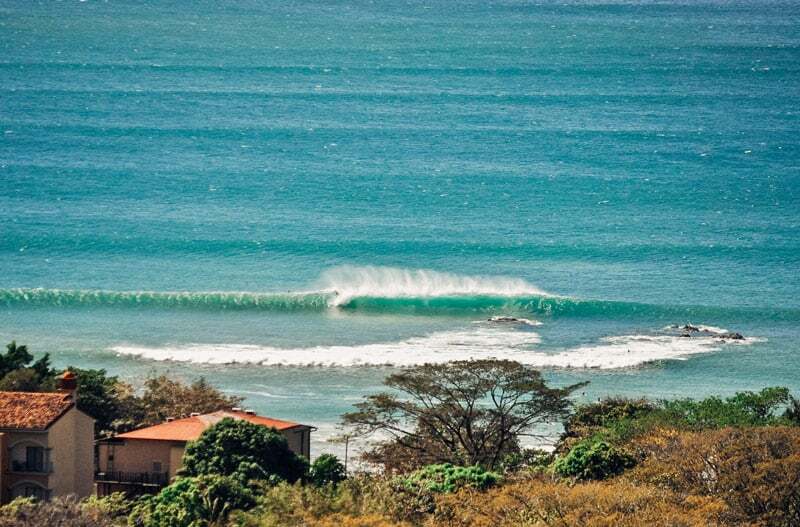 Crowd Factor: Since Tamarindo is the second largest beach town in Costa Rica, it definitely is no secret spot. But if you are new in town, here is some local knowledge. Please just be sure to look left, right AND in front of you before dropping in on a wave. Tamarindo tends to get crowded and you never know who else is going to be sharing the wave with you. Water Temperature: Generally the water temperature is bikini or boardshort weather year round, but due to the strong offshore winds from December-March that cause upwelling in the ocean, the water temperature can drop overnight and require you to wear some thin neoprene. Best Time of Year to Surf: The Rivermouth comes alive with a really good north swell during the Northern Hemisphere winter. In general, there usually is always something to surf, even if that is a tiny ankle biter wave. If you ride a longboard, you will pretty much always find a wave to ride. You can’t go wrong with food in Tamarindo, but don’t expect it to be cheap as in other Central American countries. Costa Rica has a much higher cost of living than its neighboring countries and since Tamarindo is a tourist destination, expect to pay equivalent US prices for pretty much everything (if not more) for imported items such as sunscreen and bug spray! CAFÉ TICO is my go-to place to grab an awesome cup of coffee and healthy post-surf breakfast. My favorite is the iced latte, made with coffee ice so the drink is definitely not watered down! Other great coffee places in town are Nordico, La Bodega, or Café Santa Rita. GREEN PAPAYA is hands down my favorite go-to restaurant in town for its fresh food and a five-minute walk from my place. You eat your meal outside on one of the swings—heck yes! My favorite picks are the seared ahi tuna tacos, chips with guacamole, and the AMAZING hot sauce with anything! LA BAULA has delicious thin crust pizza when I have an NYC pizza craving. This restaurant is one of the most family-friendly restaurants in town! 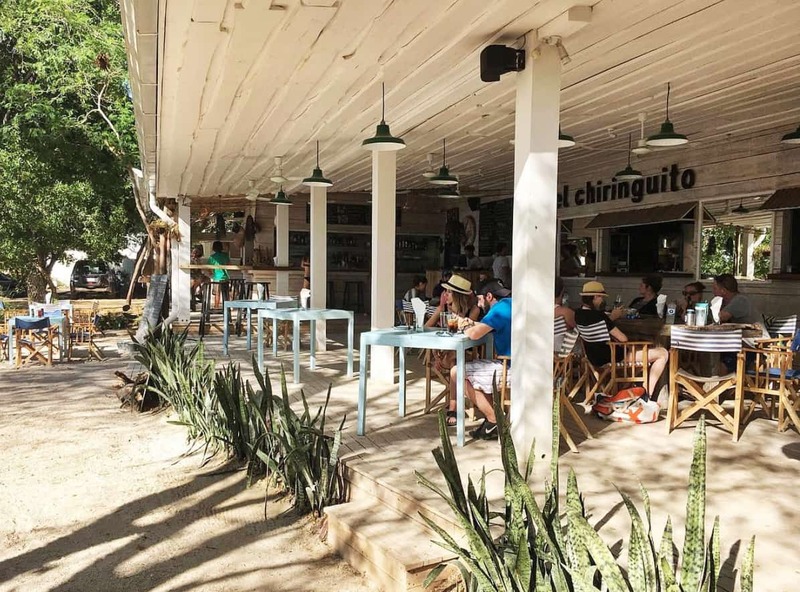 EL CHIRINGUITO is an awesome place for happy hour on the beach and to watch the sunset. SHARKY’S is the best place in town to watch sports or a fight. WILD PANDA has the best cocktails made with fresh fruit! VOLCANO BREWING COMPANY is the best place to try out craft beers from Costa Rica. Bonus points for being beachfront to enjoy watching Tamarindo’s beautiful sunsets. NOGUI’S is the best place in town if you have a sweet tooth and/or love pie! My favorite is the pineapple pie, but other great choices are the coconut cream, apple, banana, and chocolate. Other great options in town are Patagonia, Bamboo Sushi Club, Pangas, Shlomy’s, and Sprout. And if you love ice cream, head to any of the small supermarkets in town and grab a Trit – the most amazing vanilla ice cream sandwich with graham cracker cookie and a layer of chocolate fudge. As the second largest beach town in Costa Rica, Tamarindo has many accommodation options for all budgets. 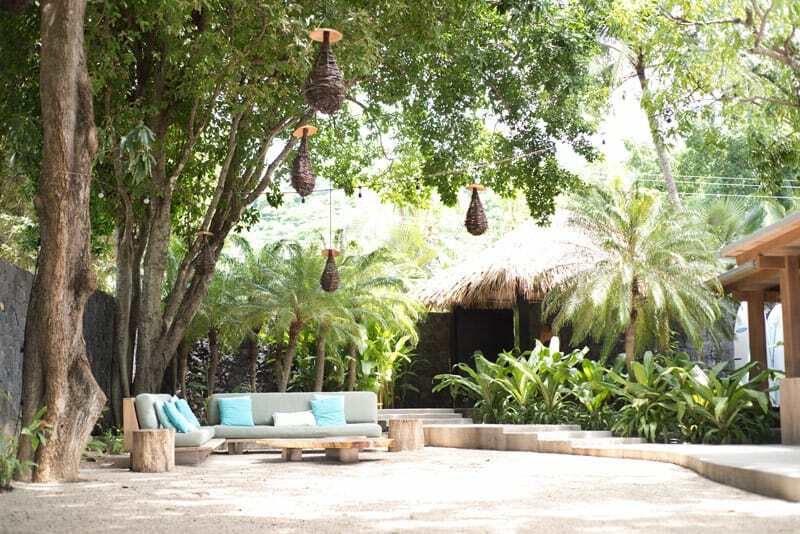 HOTEL PASATIEMPO is a 22-bedroom boutique hotel with cool cabinas and beautiful gardens. WITCH’S ROCK SURF CAMP offers a week-long surf that’s great for beginners. 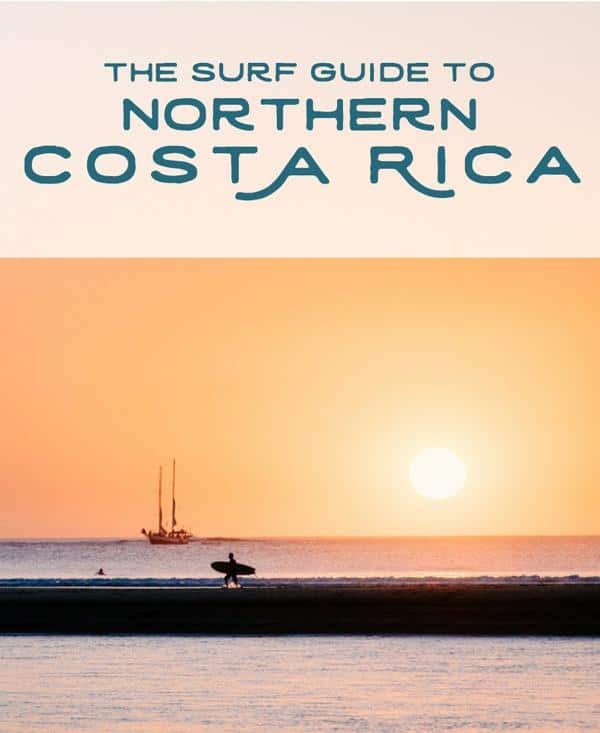 You just need to arrive in Costa Rica and they provide everything for you, from airport transportation, surf lessons, free breakfast, to a huge selection of surfboard rentals. IGUANA SURF CONDOS has 6 condos that all surround a common area with a pool, hot tub, and BBQ area. All condos include kitchens and living space, and they’re a hop, skip, and a jump to the beach. LA OVEJA NEGRA is a nice hostel that offers both dorm rooms and private cabinas with cable tv, a/c, and private bathrooms with hot water. Complete with a yoga deck, open communal kitchen, wifi, and breakfast included, Oveja Negra is a great hostel option. SELINA is a colorful and hip hostel complete with a pool, restaurant, and nine different types of accommodation (from dorm rooms to private guest rooms) to suit your taste and budget. 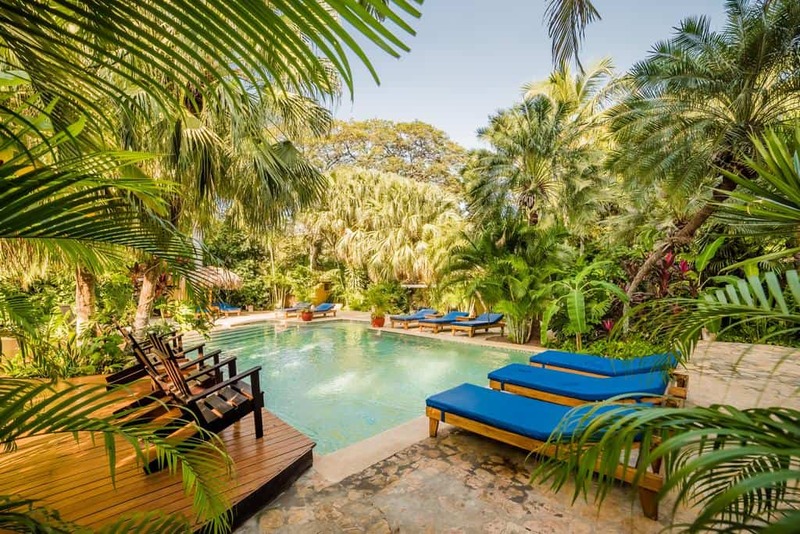 Other great options are Tamarindo Bay Boutique Hotel, Tamarindo Breeze, Cala Luna Boutique Hotel, VRBO house rentals, and plenty of AirBnB options. WATCH THE SUNSET! Rule #1: Never miss a sunset in Tamarindo, Costa Rica! Seriously, Tamarindo’s sunsets are some of the most magical sunsets I have ever seen – even if I’m slightly jaded! 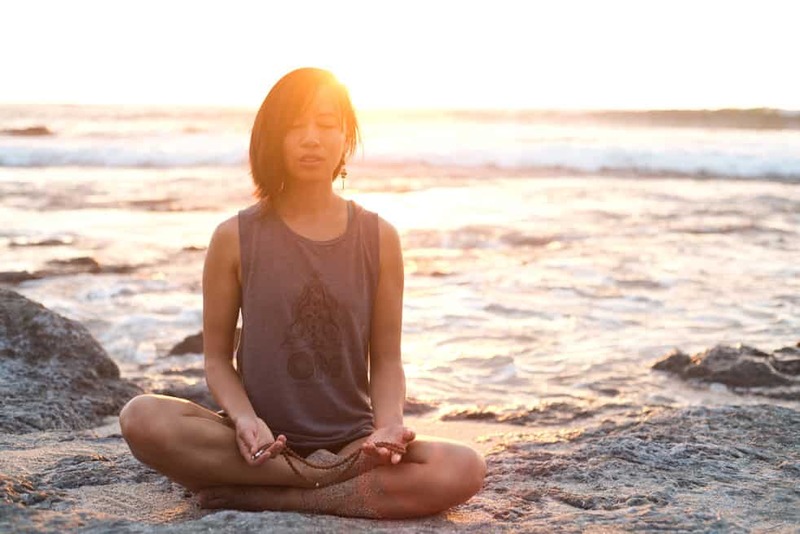 TAKE A YOGA CLASS at Mermaids + Sailors or Ser Om Shanti. Both studios have great yoga teachers and a variety of yoga and barre classes. If you need a break from surfing, fun outdoor activities in Tamarindo include ATV tours, horseback riding on the beach, ziplining, estuary tours to see crocodiles and howler monkeys, and sunset catamaran booze cruises. MERMAIDS + SAILORS Yoga Studio and Boutique has everything you need for women’s yoga and cute athleisure clothing. And don’t worry guys, they have some cool stuff for you too. 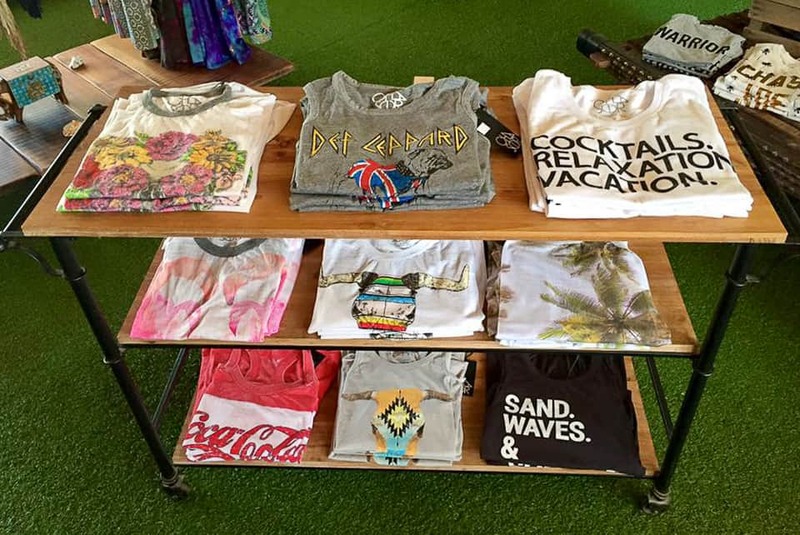 WITCH’S ROCK SURF SHOP has all the basics you need for your surf trip, from boardshorts and bikinis to wax and sunscreen. They also offer boat trips to Witch’s Rock and Ollie’s Point. EK ART JEWELRY has the most beautiful silver jewelry made with fossilized shells and gorgeous stones. Girlfish, Buena Nena, Dolores, and Azul Profundo are shops with stylish and super cute clothing. A huge thank you to Kristen for sharing her favs in Tamarindo! 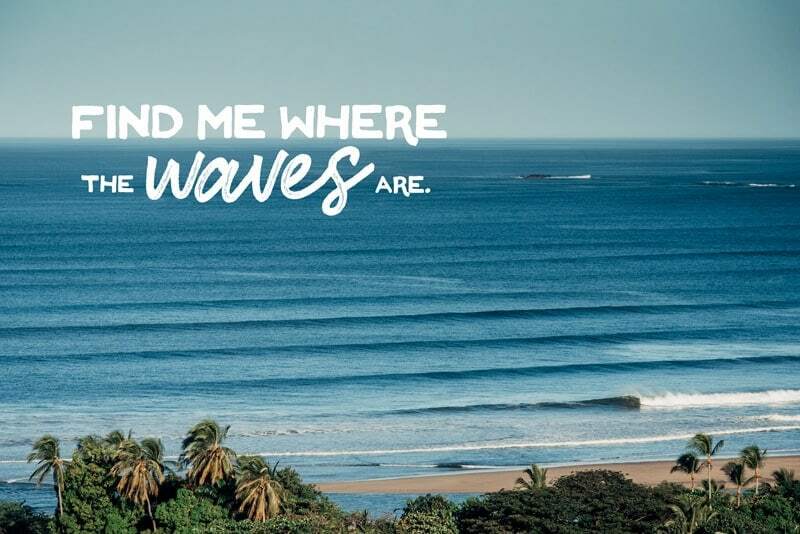 Want to learn more about the surf in Costa Rica?